Winnipeg civic committee supports renaming road that the Canadian Museum for Human Rights is located on after Israel Asper. For more information, please click here. Please click here to read a Statement from Gail Asper, President of The Asper Foundation and National Campaign Chair for Friends of the Canadian Museum for Human Rights. The thoughts and prayers of The Asper Foundation’s staff and trustees are with the family of security guard Stephen Tyrone Johns after his murder at the US Holocaust Memorial Museum in Washington, DC on June 10, 2009. This great tragedy underscores the need for the museum to continue its vital work in helping educate the public about the dangers of hatred. As well, this senseless act of racist violence reaffirms the value of The Asper Foundation Human Rights and Holocaust Studies Program and revitalizes the Foundation’s intention to continue delivering this program to high school students across Canada. 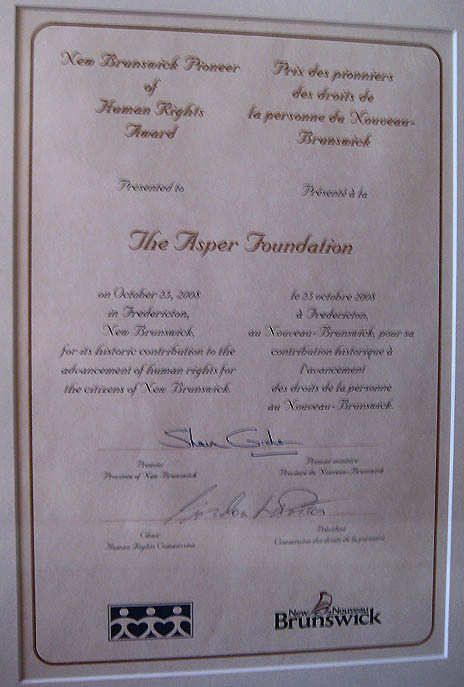 New Brunswick Human Rights Commission confers Pioneer of Human Rights Award to The Asper Foundation for its Human Rights and Holocaust Studies Program. This prestigious award recognizes human rights pioneers for their historic contributions to the protection and promotion of human rights in Canada. Previous recipients include former New Brunswick Premier Louis J. Robichaud, Dr. Gordon Fairweather, BCL, LLD, QC, OC, ONB, and the Speaker of the Senate of Canada, Senator Noël A. Kinsella. Please click here for a photo of the award. The Asper Foundation offers its heartfelt condolences to the family of Mr. Philip Weiss on his untimely passing on September 3, 2008. Mr. Weiss was a man of true passion and integrity. Click here for more on this item.